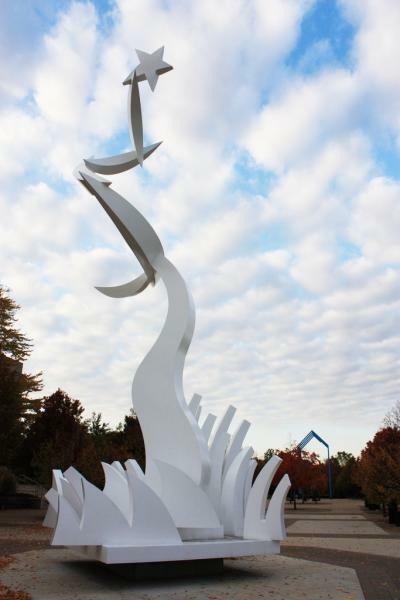 Large white steel sculpture; abstract flowing forms topped with a star. James Clover, born in Iowa in 1938, is an internationally known sculptor and an educator. Inspired by the structures of jazz music, Clover's sculptures are usually made of bronze and steel to form shapes that build upon each other to reach towards the sky. Other of Clover's works found on GVSU's campuses are located in Allendale near Mackinac Hall, the Zumberge Administration building, downtown near the Eberhard Center, and at GVSU's Holland campus.